Getting ready to host a holiday dinner this December? Before you stress over the menu, consider looking to the experts on how to make your dinner extra special. Cook up these recipes to create the perfect holiday dinner in your kitchen at Insignia on M.
Start your meal off with a quick appetizer of hot dogs wrapped in bacon. This sweet and salty snack is sure to be a hit. Embrace the season’s best flavor with these Maple Bacon Smokies from Delish. Grab inspiration from the French with a Goat Cheese-Pesto Crostini. This recipe from MyRecipes includes sun-dried tomatoes, green olives and fresh goat cheese. Yum! This Buttermilk Mashed Potatoes recipe from MyRecipes is an upgrade from the classic side as it relies on chives and garlic cloves for an added burst of flavor. This Maple-Glazed Turkey recipe from blogger Five Heart at Home is everything you’ve ever dreamed of and more. What makes it so special? Bacon, maple dressing and potatoes. 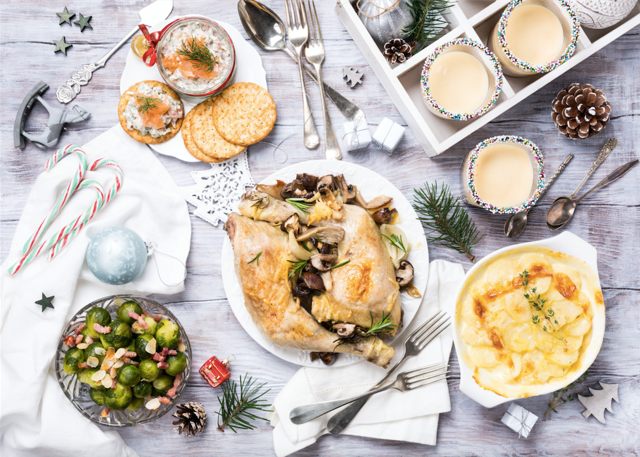 Which recipes will you use this holiday season? Let us know!